Police have renewed efforts to find a missing Manchester man and have created an image of how he may look today - eight years after he disappeared. Jordan Anthony Ratcliffe, who was 16 when he was reported missing in 2008, turns 25 today. A £20,000 reward for information which leads to his whereabouts still stands. Jordan, originally from Moston, was last seen on August 31, 2008, after he was dropped off by his aunt at around 4.45pm on Tib Street in Manchester’s Northern Quarter. 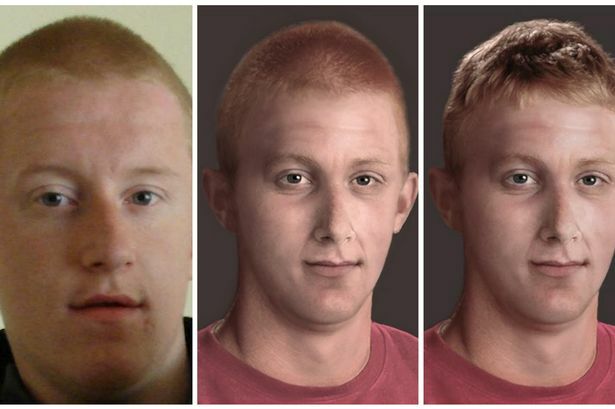 At the time he went missing, Jordan was described as white, tall, of medium build and with short ginger hair and brown eyes. He was wearing a black and grey jacket, black Nike tracksuit bottoms and black trainers. Police have digitally aged a picture of Jordan to show how he may look now. In 2014, officers received intelligence that Jordan may have been seen in Portsmouth area, although there have been no further sightings. Predictive policing software predicts the future so that agencies can increase police presence and prevent crime. Can you predict the future? Some agencies are finding that you can by using tools that enable them to perform predictive policing, which is defined as the use of mathematical, predictive, and analytical techniques in law enforcement to identify and disrupt criminal activity. This computerized analysis of crime data from records management systems (RMS), computer-aided dispatch (CAD) systems, and other police databases is poised to revolutionize crime fighting. In some ways it already has; take a look at what some agencies have achieved using today's tech tools. There's a new wave in policing, and it is aimed at preventing crimes before they occur. And it's one Florida's Orange County Sheriff's Office is riding to success. "Traditional policing is we're having a lot of crime, let's go make an arrest, let's write lots of tickets, let's generate a lot of tickets. That is output-based policing," Maj. Jeff Stonebreaker told clickorlando.com in a recent interview. But Orange County Sheriff's Office is doing "outcome-based policing, where you're trying to identify the areas you need to be and disrupt crime before it occurs," reports Stonebreaker. The agency is relying on PredPol, a cloud-based predictive policing software that uses complex algorithms to analyze stored data on specific criteria that include time, type, and location of crimes over the last decade to predict crime. The software draws red boxes on a map in areas where crime is highly likely to occur. This map is updated in real time before each shift and deputies use it to determine the best areas to patrol and disrupt crime. It's a technique shown to work. Consider that in Tacoma, WA, where the tool is used in the city's Burglary Reduction Initiative. The Tacoma Police Department reduced residential burglaries by 22%, and commercial burglaries by 8%, in the first year of its use. "We exceeded the two-year goal in the first year by a wide margin," Assistant Chief Peter Cribbin reported to The News Tribune. PredPol uses data from an agency's RMS to track the what, where, and kind of event, which can provide insight into where crimes are likely to occur next. "We only use crime type, crime location, and crime data and time; the most purely objective information available. We don't use demographic information, economic, racial, or any personally identifiable information," says Brian MacDonald, CEO of PredPol. Agencies select the crimes to target, MacDonald adds, noting the system works well for street crimes, burglaries, auto theft, robbery, and assault. The solution is designed for use by patrol officers who log in to the system to obtain a map with a series of red boxes overlaid on it. The red boxes signify where crime is most likely to occur during their shifts. If they click on a box, they might find that area had 17 auto thefts in the last six months, four robberies and two car break-ins. Officers are then encouraged to spend some time in the identified areas during their shift. MacDonald says PredPol recommends that officers spend 5% to 15% of their time in the red boxes on the map during their shifts. He notes a six-month study with the Los Angeles Police Department showed that amount of time directly correlates to a reduction in crime. "What officers do in the boxes is entirely up to each individual officer," MacDonald adds. "We don't tell them how to police. We are just telling them 'During your available patrol time, these are the places we recommend you spend your time in between calls for service.'" He adds that when this is done, agencies can expect to see "30% to 40% crime reductions in high-crime areas within the city." DJ Seals of Motorola Solutions Inc. says there is a big difference between hot spots and predictive policing, and before adding a predictive policing tool, it's important that agencies know the difference. Hot spot policing strategies use historical crime data to identify geographic areas where crime is concentrated. "You are basically watching certain crimes trend up and down. That's good but it's not predictive because when you only look at historic data, there is no forward-looking component," Seals says. He adds that policing large hot spots is also not tactically effective. If an agency wants officers to impact trending crimes, the identified areas need to be small. "Patrol officers will say, 'You can't give me a two-mile hot spot and expect me to be effective," he says. "But if you tell that officer that there have been nine car break-ins within 1,000 feet over the last three months, that's actionable information." Motorola's CommandCentral Predictive ranks the areas identified as likely to experience crime. Every box on the map is assigned a 1, 2, or 3 level of priority so that officers can determine which areas are most likely to be hit by crime during their shifts. "If officers have a heavy day in patrol, they can just focus on Tier One areas between calls," Seals says. The software also allows officers to click on the boxes to see what types of crimes have occurred. By doing so, officers can obtain narrative intelligence data about what occurred. Maybe an officer on another shift wrote a report that describes the suspect's vehicle or something like that. "So instead of just hanging around in the box hoping to disperse or displace crime, officers are actively looking for an intelligence lead on a suspect vehicle, suspect description, or MO of a crime," Seals says. All data are pulled into the system from the agency's RMS system. This happens automatically and behind the scenes in real time, so every time an agency looks at the predictive software they are viewing the most up-to-date information. The software also has a tab that allows commanding officers to bring up the last day, week, or month's call for service. This information can be brought to roll call meetings to share with officers who can see what has occurred and what is predicted to occur and where during their shifts. "They can say, here are your Tier Ones, and in this tier you're looking for this or that. Here are the ones with the greatest lead potential," Seals says. Seals sums up the effectiveness of this tool with the following story: The sheriff in a neighboring community sat down to review the software's efficacy, and when he pulled it up, there weren't any boxes. "He asked me, 'Where did all the boxes go?'" Seals recalls. "But when he went over the analytics, he found they had literally taken care of the problem. They began working on a new crime, while keeping an eye on the crime they'd eliminated in those areas." California's Garden Grove Police Department rolled out a fully integrated computer software system from Spillman Technologies, and the integrated system gives everyone from line officers to the general public detailed information about crime in real time. The software, which has only been in place for a relatively short time, has already helped identify hot spots and trends. "The software can be used for predictive policing," says Capt. Travis Whitman. "We had an auto theft where we used this hot spot analysis to identify an auto theft trend." That information led to an investigation, which ultimately ended in an arrest. Whitman says the software is "no crystal ball," but stresses it helps the agency make informed choices for deploying resources. The interesting thing is that this tool is designed for the patrol officer, not the crime analyst, according to Matt Jolly, product manager of Spillman Technologies. "We have seen a push to put the tools [traditionally only used by analysts] into the hands of more people within departments," he says. Spillman partnered with Bear Analytics, which was later acquired by LexisNexis, to create this tool. Officers log in to the cloud-based system with a username and password, and once they do, they can look at incident and call information. They also can export and analyze incident and call data and look for hot spots. "They can look at changes in crime visually," Jolly says. "They can see spikes of activity over time in certain areas and things like that, and to some degree, they can predict where crime will occur in the future. "Aside from the crime mapping and analytics capability, the tool provides users with a nice array of reports that they can build themselves and look at crime over time, i.e., where crime is occurring most, at what times of day, and what types of crime," he continues. "They can distribute these reports to all agency personnel to help facilitate communication and build patrol and enforcement activities around them." Agencies also can use this tool to see crimes in their neighboring jurisdictions if those jurisdictions use LexisNexis. "This helps a lot in crime analysis because criminals don't just operate in one area. Burglars don't just burglarize in one jurisdiction. This allows agencies to see trends across jurisdictions too," Jolly says. Users can also dig deeper into the data to see the MOs of particular crimes, patterns, and things like that, which Jolly says "historically has been the purview of the trained crime analyst. But this tool is so easy to use that even patrol officers can get in there and use it." There's a line from an old Sesame Street song that says, "One of these things is not like the others," and then challenges the viewer to figure out which one it is. If the objects were predictive policing software, Wynyard Group's Advanced Crime Analytics software would stand out from the rest. Why? Because it's not predictive policing software but rather a data analytics and visualization tool that helps police solve crimes after they happen. The tool helped a customs and border patrol agency reveal leads that helped the agency unveil a narcotics smuggling ring and gang network by identifying potential suspects and linking them to compelling evidence. In this case, a tip had come in to the agency about a shipment of meth being shipped to a national port from another country. Though the investigating agency in this case had succeeded in a number of minor prosecutions and narcotics seizures, they had been unable to locate the container of drugs or key drug traffickers. Wynyard was given 10 months of investigation records to analyze. The software's advanced analytics capabilities identified abnormal behavior and patterns through the use of advanced algorithms that allowed it to perform link analysis, mapping, visualization, and other techniques. This analysis uncovered a person of interest believed to be the syndicate leader; a key person known to the agency but not connected to the narcotics smuggling case. An analysis of this individual's call patterns and activity helped identify the location of the shipping container. More analysis revealed additional information, and within days, Wynyard found a key player in the trafficking case, how the shipment had come into the country, and discovered behavior that indicated a wider criminal network—all of which the agency had missed. These are the kinds of capabilities agencies can have with this software. "Agencies are still doing the same thing I did back in 2000 [as a crime analyst]," says Mark Massop, head of Solution Architecture-Americas for Wynyard Group. "The analysis is a very painful process," he adds. "They're analyzing data in spreadsheets, Word documents, and even handwritten notes. There is a huge potential for missing things because we are human. We make mistakes. I can teach the computer, however, not to make those mistakes." Though the tool is designed for the crime analyst and not the line officer, it can be used in many ways. Users write rules that allow them to track data coming into the agency's CAD and RMS. For instance, the analyst might write a rule that says if there are three or more burglaries with the same MO over a 14-day period, generate an alert. The software also can be used to perform a reactive type analysis; for instance, after a homicide. If there isn't a known suspect, the analyst might begin working with victimology to see if the victim had any contact with law enforcement over time. "I worked with a customer in the South and they had had five different homicides over a two-month time period. By looking at the victims, we were able to determine if the homicides were gang related," Massop says. "This type of analysis can uncover new leads in the investigation." In cases where time is of the essence, this tool can help solve a crime before the trail goes cold. "It really speeds up the process," says Massop. "When I think about my time as an investigator, 80% of my time was spent doing data research and data collection, only 20% was spent doing actual analysis about the data they've collected and collated. With this tool, they can actually spend more time doing actual analysis." Ronnie Garrett is a freelance writer based in Fort Atkinson, WI.